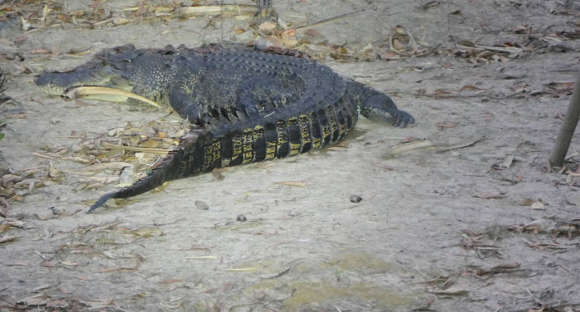 Crocodile Skin Handbags, wallets, belts and steaks are some of the products which originate with crocodile eggs harvested from the wild in the Northern Territory. Saltwater crocodile skins are recognised as the most valuable of all the reptile skins because of their beauty, evenness and strength. The skins are feel soft and flexible and can be reduced to 1mm in thickness without reducing their strength, making them ideal for high fashion crocodile skin wallets, handbags, belts and accessories which command a premium retail price. Some estimates indicate as many as 500,000 skins were exported and numbers of both saltwater and freshwater crocodiles were drastically reduced. In 1969 they were given protection as as endangered species in Western Australia, with Queensland and the NT following in the next few years. Now they are only shot or trapped to protect human life. About 200 are trapped and removed from Darwin Harbour annually. 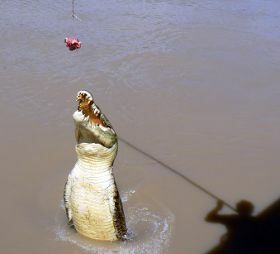 As wild crocodile numbers began to recover after the end of hunting, the NT issued several licences for crocodile farms to begin operating under strict conditions to utilise this unique resource. The Darwin Crocodile Farm at Noonamah opened in 1981,starting with crocodiles that had been trapped to remove them from Darwin Harbour for public safety, and by collecting eggs from crocodile nests in the wild. Public access to the farm also added a valuable tourist attraction to the Darwin economy. Although the original farm is now closed to the public, there are plenty of displays and crocodile tours for tourists available. In the early 80's some enterprising ex-crocodile hunters began tours on the Adelaide River which bring people close to crocodiles in their native habitat. The croc in the photo is jumping for a reward offered over the side of one of these tour boats, and showing off it's valuable belly skin in the process. Crocodile skin handbags, belts and other leather goods can be purchased from the di CROCO shop in the Smith Street Mall and from stalls at the various Darwin Markets. Contact details for wholesale farms and retailers of croc products. Return from Crocodile Skin Handbags to Enjoy Darwin.